For the past 120 years, the beautiful limestone church of St. Mary's has been the center of sacramental and communal life for Catholics in Clayton. In addition, its magnificenttowers have been a navigational aid to generations of boaters on the St. Lawrence River. The first St. Mary's Church in Clayton was built of wood. Construction began in 1842. The church was dedicated in 1844. The construction of the gothic style stone church began in the fall of 1884. It was designed by architect Ignatius D. Flynn of Cape Vincent. The local stone was quarried and donated by Joseph Charlebois. The cornerstone was laid in August of 1885. Work was completed in the fall of 1889. E. P. Wadhams, Bishop of Ogdensburg, presided at the dedication and blessing of the new church held in December 1889. Consecration followed in August 1902. The original ash pews with oak finish were manufactured in the Clayton Furniture Factory. When the interior of St. Mary's was restored in 2005, the ornata, or end pieces, were retained. The church bell was donated by Peter Fitzgerald, Sr. and manufactured by Meneely and Co. of Troy, NY. It was blessed on Thanksgiving Day, November 24, 1892. The pipe organ was donated by Mr. & Mrs. Michael Theophilus and Maurice Fitzgerald. It was manufactured by E. E. Morey of Utica, NY. It was blessed and played at a grand concert and organ recital on Dec. 12, 1901. Miss Viva Frame of Clayton was the accompanist. The stations of the Cross were made to order in France of Carton-pierre and terra cotta. They were donated by Ms. Helen C. Wall of New York City. Blessing of the Stations as held on March 1, 1899. As part of the ceremony, a few hundred names were placed in an urn and 14 names were drawn. These 14 men then carried in their hands little wooden crosses. They climbed a ladder and attached the crosses to the top of each station. The crosses can still be seen at the top of each large frame. As they descended the ladder, each dropped an envelop containing their name and an offering for the church into a basket. St. Mary's School was established in 1913. It was located where the parish center now stands. The school was staffed by the Sisters of the Holy Cross. The school closed in 1970. St. Mary's parish center was built in 1992. It provides a place for Religious Education classes for the children of the parish as well as continuing education for adults. Parish and community groups also use the parish center for their meetings. The history of St. John’s Church would not be complete without some preliminary information. Fordham University had its beginnings in LaFargeville. It began as a seminary under St. Vincent DePaul sponsorship at the LaFarge Mansion. Bishop Hughes accomplished the purchase of the mansion and 460 acres for $20,000. The LaFarge-Bishop DuBois deed was recorded on July 20, 1838. The seminary only lasted two and a half years according to one historian. It had eight to fifteen students and three professors during this time. Father Francis Guth was the first rector. Because of winter hardships and ;the fact that this area was so remote, the seminary was closed in 1843. Fr. Michael Guth, brother of Fr. Francis Guth, had the church built in 1848-1849. It was a frame building 30’ by 49’ and seated 100 people. This church was initially a mission of Watertown, New York and was called the new St. Mary’s. It was dedicated on August 22, 1849 by Bishop John McCloskey. In 1859, the church was no longer a mission church and was officially named St. John the Evangelist Catholic Church. Its parishioners were mostly of Irish and French descent, most of who migrated from the Mohawk Valley. On August 22, 1883 the church was incorporated by Rev. Edward Brice. In 1898 the church rectory was built costing $3,200. Father Joseph Pontur became the first resident pastor. In 1902, Father J. Eugene Derome became pastor. He improved the church and rectory. He built the hitching sheds to shelter the horses of parishioners attending Mass. He also had a small barn built costing a reported $450. Father Derome remained pastor until 1906. Between the years 1906 and 1928 not much is known of the activities of St. John’s Church. In 1906 Father Anthime Constantineau was named pastor. In 1907 he was replaced by Father Clarence A Kitts. Then in 1913 came Father Hugh O’Reilly. In 1917 Father Hollis D. Burns was named pastor. Father Raphael A Hoffman was assigned to St. John’s in 1920 and he remained until 1928. Between 1928 and 1932 St. John’s again became a mission, this time of St. Mary’s of Clayton. Father George Racette, pastor of St. Mary’s, became the Administrator. In 1932 because of an increase in the number of parishioners, St. John’s regained its status and Father Arthur J. Viau became pastor of St. John’s. In 1934 Father Viau began building the Shrine to Our Lady of Lourdes, which was opened to the public in 1940. Between 1954 and 1964 not much activity was recorded. Father Howard P. McCasland was pastor from 1954 until Father John M. Crable was assigned in 1962. During part of 1964 Lawrence E. Cotter and Father Joseph F. Quinn became Administrators. For the latter part of 1964 Father Louis Gardner was appointed pastor. During his time at St. John’s, in May of 1966 plans were made for a parish hall. On October 1967 the parish hall was dedicated. In 1969 Father Normand C. Cote became pastor. In 1972 Father Lawrence E. Mallette was assigned to St. John’s and in 1973 came Father Gilber Faucher. When Father Faucher retired in 1981, Father Patrick O’Reilly became the last resident Pastor. In 1983 St. John’s became a “sister parish” with St. Mary’s in Clayton. The rectory was sold. The pastor of both parishes, Monsignor Herbert Hannan resided at St. Mary’s rectory in Clayton. Since then St. John’s and St. Mary’s have shared a pastor. 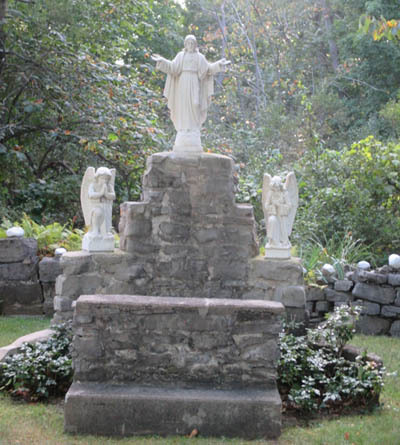 The beautiful Shrine to our Lady of Lourdes is located behind the church and parish hall. In Father Viau’s own description in a book he published in 1941, the shrine was built by him because of his deep devotion to Our Lady of Lourdes. He had been cured of tuberculosis of the bone in 1912. This was after he had made a double novena of prayers of 18 days. These were made in honor of the 18 apparitions of Our Lady of Lourdes. The book notes it was then known as the “Grotto of Lourdes at LaFargeville” or “Shrine of the Immacualte Conception at LaFargeville”. In 1935, after the ground was cleared, a wall of native stone with a planter shaped like a rosary was constructed. Round stones of similar size were selected to represent the beads of this rosary. At the end of the rosary, there is a large cement open book stating, “I Am The Immaculate Conception”. A fountain in the shape of a great “M” (for Mary) was added. Three years later, the altar was added, which is a simple piece of stone he had brought in from a neighboring farm. The grotto itself was then enlarged with an eighteen inch wall. Father Viau had a small stone inlaid in the wall of the enclave which he brought from the original Shrine at Lourdes in France. A stone prie-dieu was placed in front of the altar. In 1939, a 36” high marble statue of the Blessed Mother, which was imported from Italy, was given to the Shrine. It replaced a smaller one made of plaster of Paris. Finally, in June of 1940 the public was invited. It became a popular place with not only St. John’s parishioners, but many others of the North Country. On August 15, the feast of the Assumption of The Virgin Mary, it was estimated that 1500 people visited. On this day the rosary wall was blessed by Monsignor Joseph Creeden and ten priests from nearby parishes participated. Soon many came from distant points, even bus loads, in hopes of cures or favors by devotions at this Shrine. During the first summer over 10,000 people visited. That fall, a small chapel measuring 18 by 15 feet was built. It was said to shelter visitors during inclement weather. During the later 1940’s and early 1950’s Mass was said there instead of in the church during the winter months. A large window with a view of the Grotto was installed in the chapel. Many believed Father Viau did this so he could look out at the rosary wall and Grotto in devotion and meditation even in inclement weather. Over the years much work has been done to restore and maintain the Shrine. Stones from Apparition Hill, Medjugoria were embedded in the shape of a cross at the base of the altar. Over the years in the summer, Mass has been celebrated in the shrine.